Pope Francis arrives to talk to journalists during his flight from Rome to Panama City, Jan. 23, 2019, where he will attend the World Youth Day. Pope Francis said Wednesday that fear of migration was "making us crazy'' as he began a trip to Central America amid a standoff over President Donald Trump's promised wall at the U.S.-Mexico border and a new caravan of migrants heading north. 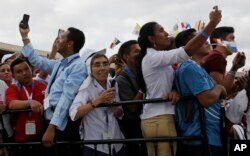 Spectators waved Panamanian flags in greeting and shouted, "This is the youth of the pope!'' After a brief welcoming ceremony, he was driven away from the airport and did not have any more activities scheduled for the evening. Francis landed as Venezuela's protracted political crisis flared up, with the opposition president of the country's National Assembly declaring himself interim president and several regional countries, including the United States, recognizing him. The Vatican had said previously that the pope would refrain from explicitly referring to Venezuela while in Panama, but the developments ensured he would face questions about the South American nation during the trip. The Roman Catholic Church's first Latin American pope and the son of Italian immigrants to Argentina, Francis has made the plight of migrants and refugees a cornerstone of his papacy. He is also expected to offer words of encouragement to young people gathered in Panama for World Youth Day, the church's once-every-three-years pep rally that aims to invigorate the next generation of Catholics in their faith. People take pictures as Pope Francis arrives at Tocumen international airport in Panama City, Jan. 23, 2019. Carlos Felice, a 37-year-old Venezuelan living in Panama for five years, right, confesses to local Catholic priest Gabriel Agustin Guardia in an outdoor confessional, after exercising with his dog at Omar Park in Panama City, Jan. 23, 2019. Pope Francis arrived in the country later in the day. This is the first papal visit to Panama since Pope John Paul II was there during a 1983 regional tour that famously included an unscheduled stop at the tomb of Archbishop Oscar Romero in El Salvador. Romero had been gunned down by right-wing death squads three years earlier, at the start of El Salvador's civil war, for having spoken out on behalf of the poor. Salvadoran bishops had hoped Francis would follow suit and make a stop in El Salvador this time to pay his respects at Romero's tomb, since Francis canonized him in October. But the Vatican said a Salvador leg was never really in the cards. Noriega eventually surrendered, ending one of the more unusual U.S. military operations: It involved U.S. troops blasting heavy metal and rock music at the embassy to try to force Noriega out. This year, the pontiff has already scheduled trips to the United Arab Emirates, Morocco, Bulgaria and Macedonia.